Normally we shy away from really touristy places, but sometimes we are tempted. The prospect of caves is always a lure. I’m glad we visited in the off season, so most of the adjunct “attractions” were shut. Like whatever this is…seems like a mining artifact display or museum, which might have been cool, but was shut. Also what might have been cool was the ice that was on the wall behind, but had melted by the time we rolled up. Oh well. You can’t get through the tour without hearing about those two Missouri farm boys, Frank & Jesse James. Notorious and vicious, they allegedly hid out in these caverns for a while. Three days to be exact. They were traced here and a short siege began, but the law men didn’t know that there was a back door. Frank and Jesse did though and they escaped, never to return to these caverns again. And they are caverns. 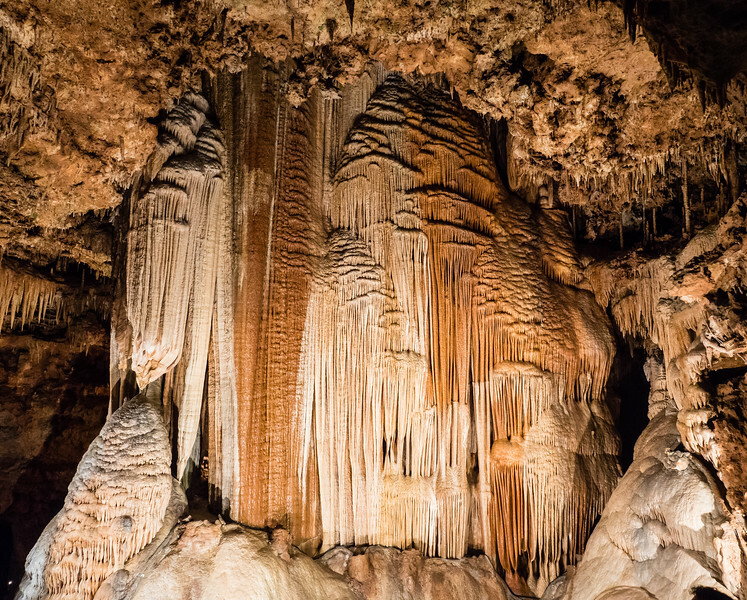 Caverns are not caves. Caves are not caverns. Caves are single spaces, rooms if you will. 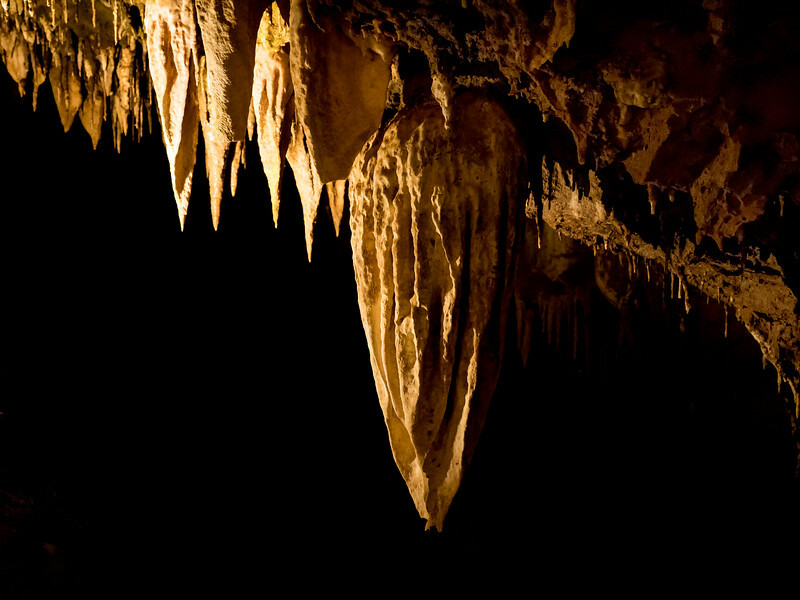 Caverns are a series of interconnected rooms. This particular example is a little over 4 1/2 miles in total length, but only a small part is included in the tour which takes about 90 minutes. Because it isn’t a self-guided tour and we had another dozen people with us, I decided to skip the tripod and handhold the G9. For the most part it worked out – I found things to brace with and it was well lit enough that the ISO didn’t get too high. 3200 was about the top end. I was impressed with the auto white balance – I didn’t have to adjust much in post. It also did a great job with the huge dynamic range – the details in the dark areas were there even if the highlights were blown a little in other parts of the photo. The system is estimated at 400 million years old and is largely made up of limestone although there is some harder stone near the main entrance – dolomite I think. Not many fossils have been found and the only claim is some fossilized algae. Neat, but not too impressive if you know what I mean. 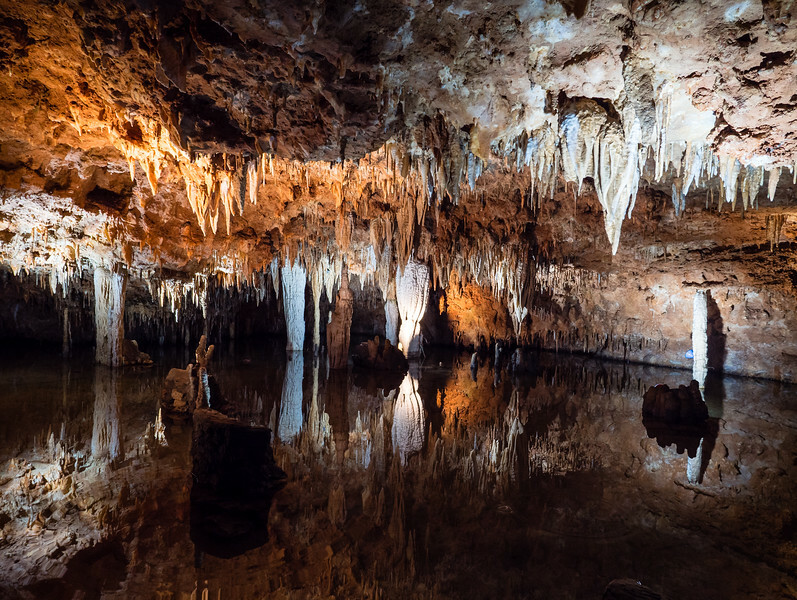 Humans have been drawn to the caverns for thousands of years. Some Native American artifacts have been found in it, but it doesn’t look like it was continually used by them. Europeans are a different story. 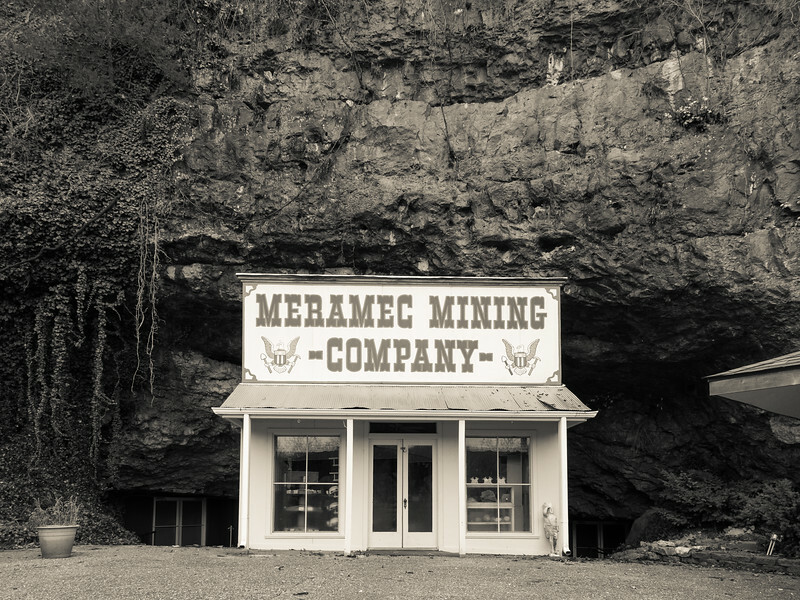 Since its “discovery” by the French it has been used for mining. Saltpeter specifically, for use in gunpowder, but after the works were destroyed during the Civil War, it never continued. Tourism is the big money-maker now; changing hands over the years to become quite a sprawling complex with, camping, Meramec river tours, a restaurant and a huge gift shop. Some of the owners weren’t content with its natural awe and beauty though. They had to turn this into a spectacle. Scroll down. Are we really such a vacuous population that we need this kind of thing? What has happened to our ability to appreciate nature for itself, without dressing it up in this kind of vulgarity? Ugh. It disgusted me, but it was only an opening act. Going back through the system, the guide turned on different lights and this lovely illusion appeared. It looks as if there is an enormous crevasse below, but in reality it’s only 18 inches of water. 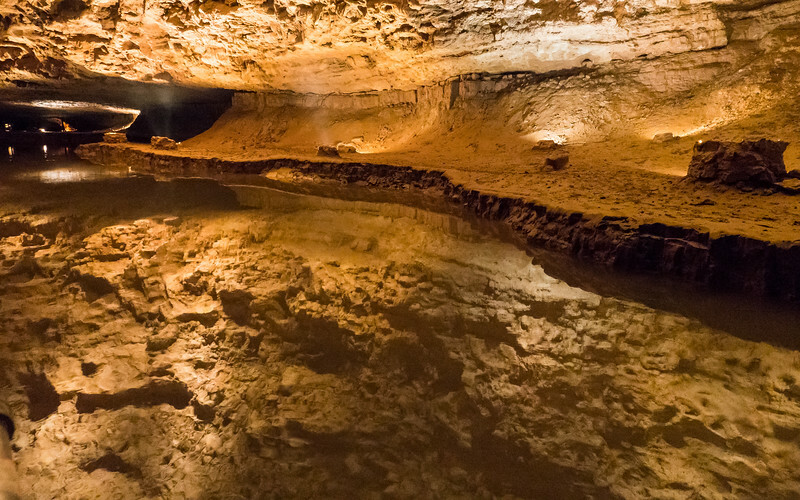 It’s near a section that was used in a film adaptation of Tom Sawyer – the Tom and Becky cave scene in particular. There was mention of other movies being made here and of course the Frank and Jesse story. 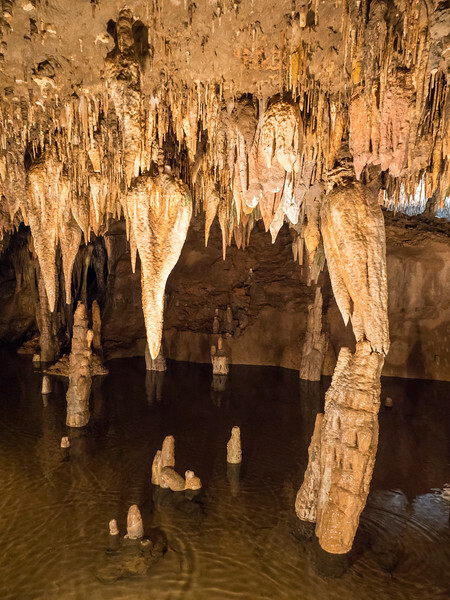 As part of the history and use of the caverns, it belongs, but there are other things that don’t. More of that at the end. Some of the choices the operators made were baffling. Like to keep the formation below growing by means of supplemental water. The original water source dried up or was diverted probably thousands of years ago, but it’s on life support now. But that isn’t the worst of it. Projected onto this natural wonder was a display that was utterly crass. We had to sit through a most torturous show of rabid patriotism and religion with a huge helping of smarm and bad taste. Colored spotlights highlighting certain aspects of the rock was one thing, but a slide presentation of bible verses, “patriotic” images bordering on jingoism, cheesy graphics all topped off by a recording of Celine Dion singing God Bless America!! Couldn’t they find an American singer for that? OMG it was awful. My husband and I alternately cringed and laughed and I couldn’t bring myself to waste even 1s and 0s on it, so no pics. Nature doesn’t need this kind of “help”, but in the midwest I guess it does. Nowhere else in our cave exploration have we ever come across anything so degrading to the ancient geology on display. Not in Oregon, California or New Mexico. 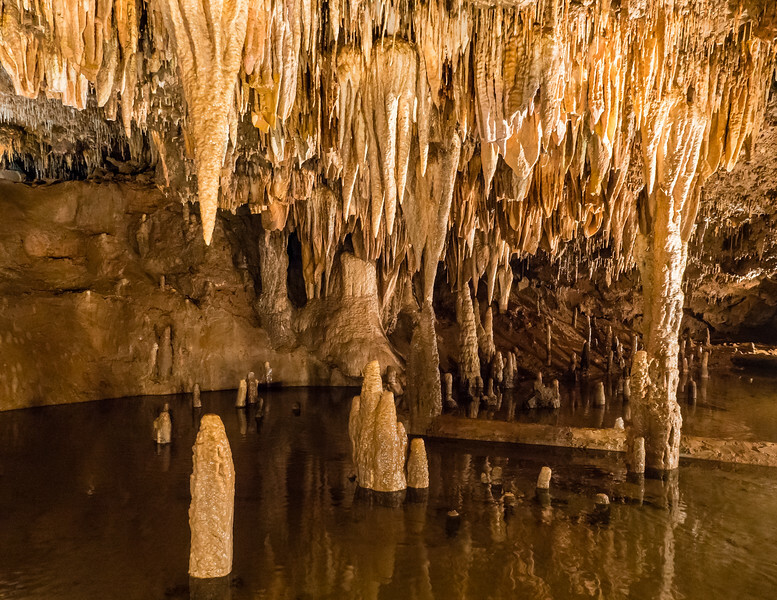 Maybe not every cavern system in Missouri is like this, but it was a little insulting. As if I need these silly commercial underpinnings to appreciate the history and geology. Anyway, enough of that. 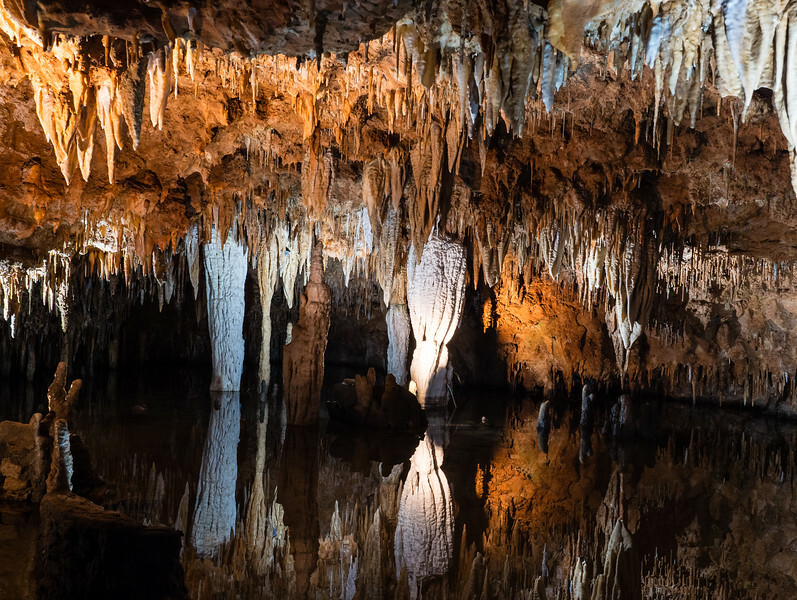 Hopefully you have a sense of how beautiful the Meramac caverns really are and can be forewarned if you decide to visit them. Those 50-odd billboards on the highway might just talk you into it. Thanks for the warning, Kristin. I also hate it when nature is “enhanced” — not to mention being enhanced in the manner you describe. It’s not quite as bad, but I’ll warn you about going to Mount Rushmore for more reasons than I’ll put in this comment. And especially don’t go when they hold the local commencement there and broadcast it throughout the whole park. And that’s after charging you an arm and a leg to park. Thanks Pat! I’ll take the warning and stick to watching North by Northwest when I need a Rushmore fix. Too funny and sad. 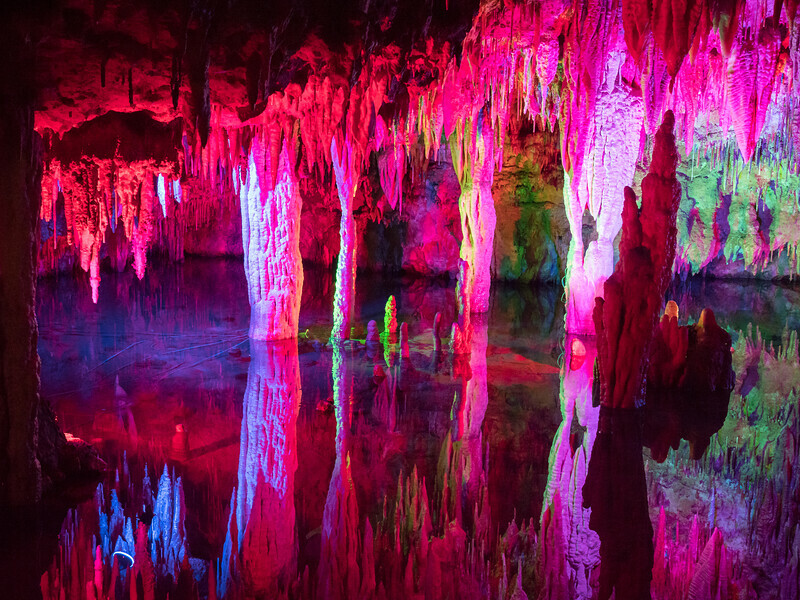 Nonetheless, I can see you found the beauty of the caverns. I liked Cave of the Winds in Manitou Springs, CO, even though it had some silly things there. However, they do have a bit of human stuff there that really is cool: a 1 watt lightbulb from around 1905. The thing still works – and they turn it on once a year. I didn’t find any of the repulsive stuff you mentioned (light shows and religion and patriotism of whatever variety), just a really interesting place to explore. And I got lost as I was spending so much time taking pictures they were about ready to send out a search party . . . I tried to see the humorous side of things, I really did, but it was a fairly expensive little tour and I’d much rather have explored on my own. Here’s a funny thing – the tour guide would shut off the lights as we passed through areas and turn them back on again when we came back through. I’m all for conserving energy, but this was odd. I guess it’s all part of being a money-making tourist trap and not a national park or monument.